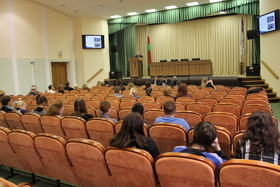 6-8 April 2011 Grodno City in Belarus hosted a workshop on promoting city attractiveness. Grodno city-museum was the conference title, which was deeply discussed if it should become the slogan for branding the place, or not. Poland, Lithuania, Norway and Latvia have visited Grodno to share their views and help with elaboration of ideas. The two-day seminar consisted of a plenary, the city study tour and workshops for concrete suggestions. The conference was opened by the officials of the Grodno city, who welcomed the guests and introduced them to Grodno history, touristic objects, population trends and challenges. Trans in Form project manager Bjørn Frode Moen presented the project and the role of Belarus in it. Communication manager Alf Johansen made a presentation of the TiF importance globally and how Grodno could see them selves in such context. An expert from Poland Grazyna Kurowska shared her views and knowledge on city branding and promotion. Suggestions from the guests were to have something different. A city has a beautiful and big river that is not exploited at all. Grodno does not use it for cafes or public spaces, there are also no flats or pedestrian paths that would be extremely attractive! Why not to build a pedestrian bridge from the sleeping part of the city to the very centre? It would be also possible to make some low-cost improvements like skate-parks or outdoor cafes. The idea to call Grodno – a city museum was discussed a lot. Some people found the slogan old fashioned and thought there must be a better way to brand the city. There was also an opinion that despite the city has a beautiful church they should not focus on it as the single one interesting object for tourists to see. Because travelers like to experience different things like art, culture, restaurants, architecture, music and very few of them would like to spend a lot of time for history and churches. Moreover, regarding a church as the main tourist attraction, the city puts itself to a position of a competitor to Vatican, Moscow, St. Petersburg and many others. Why not to have something unique? It was the first look into scenario planning in Grodno. To find the best solution would take much more time and discussions. However, the conference gathered people form many different areas with diverse thinking and it definitely gave a lot of ideas for further consideration and development.